A horse riding rental can be one of the most fun and affordable ways to enjoy a horse. There is no long term commitment and the sky is the limit on the variety of places to ride! 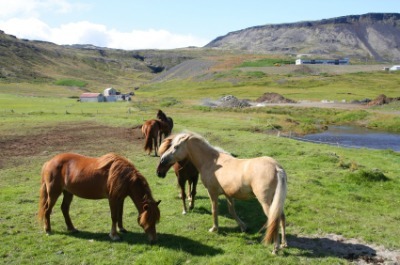 Horse rentals are available all over the globe to those on vacation. You can also find stables close to home for riding a horse your very first time. What is a Horse Riding Rental? A horse ride where you pay an hourly fee is a rental. Usually the minimum rental is one hour and the cost will be between $25 to $50 per hour. The most common form of rentals are for trail rides. A stable will offer rides ranging from one hour up to a full day of riding. Some stables also offer overnight camping trips or multi-day rides where you ride from one inn to the next. Other outfitters may rent you a horse for a whole week or month to use on your own for a hunting or pack trip. Horse rides can take place almost anywhere and can allow you to see places you never would have before! If you've never ridden before, start locally at a nearby stable. Do you dream of riding a horse in one of these places? Many local and more exotic destinations offer a horse riding rental option so you can enjoy the world from the back of a horse! All you have to do is start dreaming of where you want to ride. Where do YOU want to ride ? 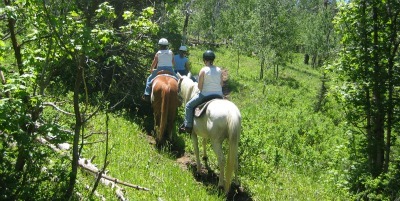 Most horseback rides on the trails are guided for safety reasons. That means an experienced horse person that is familiar with the horses and trails will be with you the whole ride. 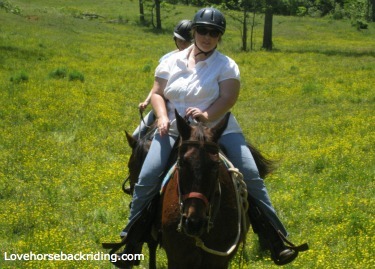 Your guide is your go to person for any question about riding your horse or safety. Your guide should be CPR/First Aid certified. Don't forget to ask if they are certified when you call to book your ride. If you have any problems while riding you MUST notify your guide immediately! Guides generally know about the history of your destination and the scenery you will see on your ride. Non-guided rides are not common anymore. This type of ride is where you rent a horse and you have a start and end time for the horse rental. You explore on your own during that time without any help from the staff. For beginner riders this is especially dangerous. I don’t recommend this type of ride unless you are very experienced with riding horses and navigating unknown territory. There are too many things that can go wrong with inexperienced riders on horses when help is not available. Any of those scenarios can be terrifying for an inexperienced rider! Different stables have different policies for kids and at what age or if they are allowed to ride. The child’s parent or legal guardian will need to sign the waiver for each minor. Some stables may allow “doubles” for younger kids. A double is where the child rides on the same horse as the adult. Most stables will require and provide approved horseback riding helmets for minors (and sometimes all riders) because of liability issues. The guide or wrangler will ask you about your past riding experience. It is very important that you are HONEST in your response. If its been awhile, or you’ve never ridden say so! This will allow the guide to match you up with the perfect horsey partner. If you overstate your abilities, you may find yourself on a horse you shouldn’t be on or one that you won’t enjoy. While most stables only have horses that a variety of beginner level riders can ride, some will have horses that may be quicker, more stubborn or have less experience on the trail. If that is not they type of horse you want, make sure you say so! A guide usually takes a whole group on a ride. That could mean up to 10-12 riders will be on the same ride. If there are two guides (one in front and another in the back called a drag rider) then you could have up to 20 or more riders. In most situations it won’t be just your family or friends taking a ride together. If you want your group only as a ride, call ahead and see if you can make a separate reservation. Many stables will try to accommodate your request or will do so for an additional fee. Rides are usually done single file behind the guide with those that are least experienced or the most afraid closest to the guide. The only exception on a horse riding rental I’ve had is on a beach ride. The guide allowed us to ride side by side. The guide will tell you how to steer, stop, and go, but a rental is not a horse riding class. If you want to be prepared for your horse riding rental check out my horse riding for beginners page for some pointers both on the ground and in the saddle. This article also covers what you should wear! Planning a longer horse adventure or trail ride? Lessons will boost your confidence before venturing out into the great wide open. I strongly recommend some lessons if you are doing a longer ride, overnight trip, staying at a dude ranch or going on a horse riding vacation. Be sure to listen to and follow your guide’s instructions. The guide has your safety in mind with all of their directions! Listen when they tell you to keep a certain amount of space between your horse and the tail of the horse in front of you. You don’t want to be on the receiving end of a kick meant for your horse. Ouch! 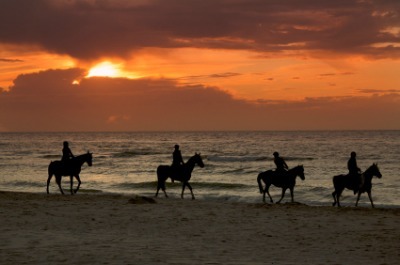 Here are a few other horse riding rental tips for you! 1. Always listen to and follow your guide’s instructions. They are trained in how to manage large groups of riders. 2. Leave anything that can fall off you in the car. It’s no fun to get back from a ride and not have the keys to your car! You wouldn’t believe how many wallets, car keys and sunglasses I’ve found on the trails! 3. Don’t bring backpacks, bags or big floppy things to carry with you on the ride. Besides throwing you off balance, these things can spook a horse and put you in for a ride you’re not likely to forget for all the wrong reasons. Even if the horse is used to it, I still don’t recommend them. You just don’t know what will upset a horse. If they offer a saddlebag to put your things in that is fine. 4. Make sure you are ready for the outdoors. A horse riding rental almost always means you'll be outside. That means having put on sunblock/bug spray already before you arrive. You may also need a rain jacket, but many stables offer a slicker in bad weather that is already on the saddle. If you are on a longer ride especially in the higher elevations will need to layer your clothing. 5. Use the restroom before you mount up and head down the trail. You don’t want to wind up having to stop the ride and trek way out away from the group to use nature’s facilities. In addition, with all that bouncing around you can imagine how needing to go use the restroom could be quite unpleasant! Although most guides will help you get back on, it won’t be as easy unless you can find a rock or something to stand on to help you up! Have fun! You’re going to have a blast with your horse riding rental so go out, smile and enjoy your horse and the scenery. There are few things more satisfying than seeing the world from the back of a horse! Western Horse Riding- Most (but certainly not all) horse riding rentals on the trails in the USA are done while riding western. Check out this page to learn about the history and style of western riding. Horse Riding Gear- If you want a more in depth look at some of the gear found on horse riding rental horses or what many riders wear and use check this article out.